Kerala PSC LDC (LD Clerk) exam rank list 2015 category No: 218/2013 for all districts (Thiruvananthapuram, Kollam, Pathanamthitta, Alappuzha, Kottayam, Idukki, Ernakulam,Palakkad, Thrissur, Malappuram, Kozhikkode, Wayanad, Kannur and Kasaragod) will be published today, 30th March 2015. 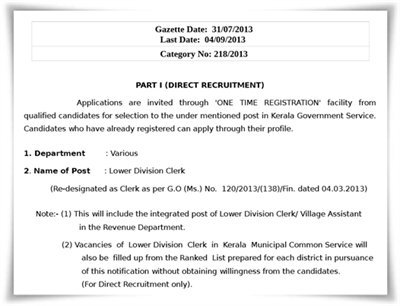 Coming into effect from 31st March 2015, the rank list of 48,887 candidates will be published by Kerala PSC online on its official website. Read more to know about Kerala PSC Rank List 2015. The Kerala Public Service Commission (PSC), which is in charge of conducting various public exams in the state, will publish the LDC Rank List 2015 on March 31, 2015. As the certificate verification procedure and short list entered the final stage, the rank list 2015 category No: 218/2013 for all districts (Thiruvananthapuram, Kollam, Pathanamthitta, Alappuzha, Kottayam, Idukki, Ernakulam, Palakkad, Thrissur, Malappuram, Kozhikkode, Wayanad, Kannur and Kasaragod) will be published today, 30th March 2015. Coming into effect from 31st March 2015, the rank list of 48,887 candidates will be published by Kerala PSC online on its official website. As validity of the current rank list published on 31 March 2012 comes to an end today, Kerala PSC has decided to provide a new list. The rank list which was approved by Kerala PSC chairman K S Radhakrishnan on 25th March 2015 will be published at http://www.keralapsc.gov.in/, the official website of Kerala Public Service Commission. With a pay scale of Rs 9940 – 16580, the list of selected candidates published by the PSC will remain in force for a minimum period of one year. 3% of the vacancies reported shall be reserved for the appointment of physically disabled persons. The Kerala Public Service Commission (KPSC) conducts exams for the post of LD clerks (LDC) in various departments in Kerala. According to the procedure, based on the results of the OMR exam, district wise shortlist will be published by the PSC. Candidates, who found their names in shortlist, should appear for document verification at district PSC office. After the verification, district wise rank list will be published. There will be a main list and supplementary lists based on community and physical handicap. With more than 10 lakhs candidates appeared for the exam, the Kerala PSC will publish a rank list of 48,887 candidates, effective from 31st March 2015. Kerala PSC LDC (LD Clerk) exam rank list 2014 -2015 category No: 218/2013 for all districts (Thiruvananthapuram, Kollam, Pathanamthitta, Alappuzha, Kottayam, Idukki, Ernakulam,Palakkad, Thrissur, Malappuram, Kozhikkode, Wayanad, Kannur and Kasaragod) will be published in March 2015. The valuation of the papers is currently progressing in full swing. The final rank list will be published based only the marks avoiding the interview. Kerala PSC LDC (LD Clerk) exam probability list 2014 category No: 218/2013 for all districts (Thiruvananthapuram, Kollam, Pathanamthitta, Alappuzha, Kottayam, Idukki, Ernakulam,Palakkad, Thrissur, Malappuram, Kozhikkode, Wayanad, Kannur and Kasaragod) will be published by 15th September. The valuation of the papers is currently progressing in full swing. The certificate verification will be conducted in October 2014. Kerala PSC LDC (LD Clerk) exam probability list 2014 category No: 218/2013 for all districts (Thiruvananthapuram, Kollam, Pathanamthitta, Alappuzha, Kottayam, Idukki, Ernakulam,Palakkad, Thrissur, Malappuram, Kozhikkode, Wayanad, Kannur and Kasaragod) will be published on 30th October. The valuation of the papers is at the final stage while the certificate verification will be conducted from 27th November 2014. Kerala PSC LDC (LD Clerk) exam short list/probability list 2014 category No: 218/2013 for all districts (Thiruvananthapuram, Kollam, Pathanamthitta, Alappuzha, Kottayam, Idukki, Ernakulam,Palakkad, Thrissur, Malappuram, Kozhikkode, Wayanad, Kannur and Kasaragod) has been published on 28th October at the official website. The valuation of the papers is at the final stage while the certificate verification will be conducted from 27th November 2014 onwards.